As a web developer that discovered TRP 1 year ago and is very grateful for the subreddit, I've always wanted to contribute here, but I never knew how, until now. After TRP has been quarantined, I feared it would get banned one day. So I decided to figure out a way to scrape the entire subreddit and have it viewed on a simple website. I saw TRP's current backup of the subreddit and I wasn't happy with its design and hard-to-use website (and its lack of posts). So I decided to spend 8 hours trying to figure out how to scrape the entire subreddit and then code a website to view the posts as simple as possible. Edit: Thank you for the amazing feedback everyone. I just finished scrapping RedPillWomen & RedPillParenting & ThankTRP and added them both to the website. Up to 1.5k posts added. Edit 2: Almost every single post (around 64k) ever posted on TRP, from all the way back to 2012 till now, can now be viewed on the website. Edit 3: Option to search through entire archive added; search through titles, posts, authors and even comments. 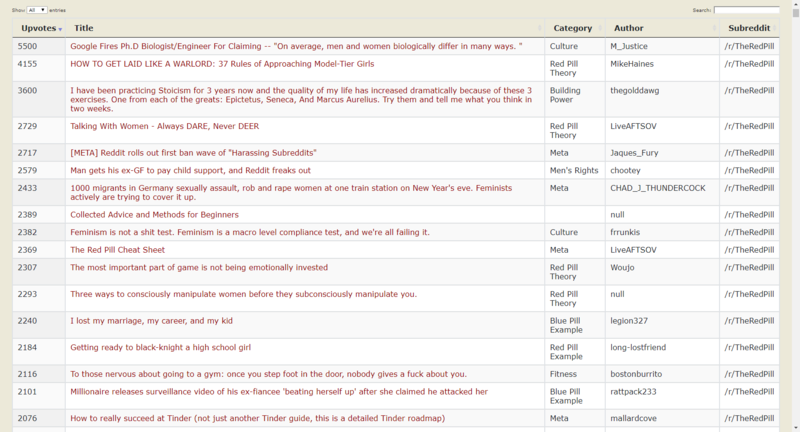 Edit 4: Every single post from askTRP, becomeaman and RedPillWomen (altTRP + GEOTRP) has been archived; that counts up to 60k posts since 2012. We are now at a total of 160k archived posts! **Link:** https://theredarchive.xyz/ **Preview:** https://i.imgur.com/BXXQOke.png & https://i.imgur.com/niDdoEW.png As a web developer that discovered TRP 1 year ago and is very grateful for the subreddit, I've always wanted to contribute here, but I never knew how, until now. After TRP has been quarantined, I feared it would get banned one day. So I decided to figure out a way to scrape the entire subreddit and have it viewed on a simple website. I saw TRP's current backup of the subreddit and I wasn't happy with its design and hard-to-use website (and its lack of posts). So I decided to spend 8 hours trying to figure out how to scrape the entire subreddit and then code a website to view the posts as simple as possible. **Features:** * 160,035 posts from TheRedPill & askTRP & RedPillParenting & RedPillWomen & ThankTRP & becomeaman & altTRP & GEOTRP * Comments (+ replies) included * TRP's subreddit theme * Search through all the posts instantly * Lightweight and simple to use website & no ads * DDoS protected and secured **Edit:** Thank you for the amazing feedback everyone. 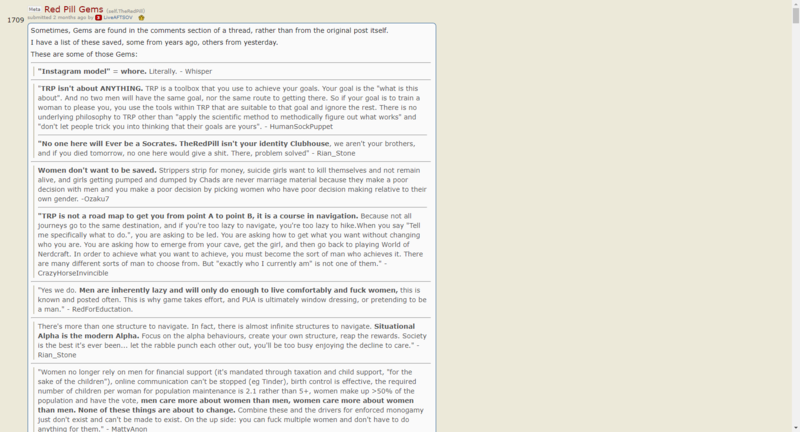 I just finished scrapping RedPillWomen & RedPillParenting & ThankTRP and added them both to the website. Up to 1.5k posts added. **Edit 2:** Almost every single post (around 64k) ever posted on TRP, from all the way back to 2012 till now, can now be viewed on the website. **Edit 3:** Option to search through entire archive added; search through titles, posts, authors and even comments. 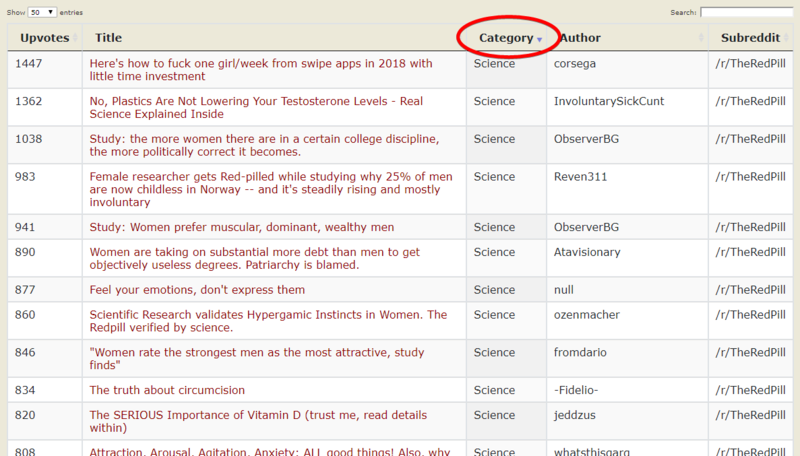 **Edit 4:** Every single post from askTRP, becomeaman and RedPillWomen (altTRP + GEOTRP) has been archived; that counts up to 60k posts since 2012. We are now at a total of 160k archived posts! We will always welcome more backup points, so thank you for helping out. Our backup includes 3,176 Posts between TRP and AskTRP. With over 519,619 individual comments. Counting RPW and ThankTRP, our total archive is 4,573 posts. In case of emergency we will release the entire database as torrent. FYI. Forums opening soon with new mobile-friendly design. Doing that is possible. Click on the Category column on the table two times then you'll see the most upvoted posts on that flair (or type the entire category's name in the search function). You can even see the most upvoted posts of each subreddit; just click the Subreddit column. Doing that [is possible](https://i.imgur.com/6aSMHce.png). Click on the Category column on the table two times then you'll see the most upvoted posts on that flair (or type the entire category's name in the search function). You can even see the most upvoted posts of each subreddit; just click the Subreddit column. Thank you for the feedback! Refresh page > click Column tab two times then you'll see the posts from each category in order of most upvoted. What language did you use to scrape it? It's awesome btw good work. PHP, my favorite language. :) Thank you! Yeah BeautifilSoup is fast and reliable, and for dynamically generated websites I use Selenium with headless Firefox. Wow.... You're either a masochist or something else. Sometimes if you already have your favorite tool and it works, there's no need to learn another tool (or in this case, API). Scraping is always harder than just using the api. So if I've been using BeautifulSoup since it came out, have an entire framework and dev environment dedicated to scraping websites and have little to no experience with APIs, which is gonna be harder? which is gonna be harder? Scraping, by far. It doesn't matter how much experience you have, you still have to do the legwork. An API is just using a few pre-packaged methods, you don't need experience on it. Out of curiousity, why is PHP your favourite language, and where did you learn it? I don't remember, but long ago I wanted to start coding my own screenshot software, and my friend told me I could do that with my back-then favorite language & PHP, so I started learning PHP. I learnt PHP by coding, and whenever I wanted to code something, I searched on Google about it and read the code. PHP is really simple. I don't remember, but long ago I wanted to start coding my own screenshot software, and my friend told me I could do that with my back-then favorite language & PHP, so I started learning PHP. I learnt PHP by coding, and whenever I wanted to code something, I searched on Google about it and read the code. PHP is really simple. I'll run my scrapper on all the Red Pill subreddits from the sidebar, I kinda forgot about those. They'll be on the site within 48hr. I'll run my scrapper on all the Red Pill subreddits from the sidebar, I kinda forgot about those. They'll be on the site within 48hr. The community that keeps on giving, way to go! Looking forward to contributing more. If you have more ideas about TRP for a web developer, let me know! I can invite you to our private dev forum (open soon). Instead of duplicating efforts we have a lot of tasks that need doing. I've sent you numerous e-mails, but haven't heard back. Is it because you didn't get them or you only invite trusted members and whatnot? I haven't forgotton about you. I simply haven't gotten the private forum running yet. Lots of work going on in the background. Did something similar here: http://trpbackup.com I have every single post backed up but only the top 1000 are browsable at the moment. You’ll be able to search all of them soon though. This is great that so many backups are being created! TRP shall live on. Great website but is there an option to search by date? When I click on these "load more comments" in old posts, it opens up a seperate "about:blank" page. Load more comments, unfortunately, doesn't work, as I wasn't able to scrape those. Thank you, looks good. Unfortunately, I didn't scrape the posts using Reddit's API. I might be able to find another way to do it, though. Until he fixes it, forums.red does have exhaustive comment chains. With the way things are going having extra back ups is probably a good thing. I've been working on one of TRP backups, tried to post here, but the post did not make it. I have completed 2016 and 2017, 2013-2015 are in progress, and I'm going to periodically update 2018. The entire archive contain 68,000+ posts + uncountable comments, no scripts and other unnecessary information (which reduced the size by half at least). You can never have too many backups, especially with the purging of "controversial" content and people online as of late. Any chance you could do that for mgtow as well? Not to mention some other manosphere subs. Not sure, not a big fan of that sub. If more TRP people want that then I can make it happen. Just wanted to thank you as well. This makes a real impact on men everywhere, usually for the better. Thank you! This is just so compact and simply amazing. Contains every type of sorting and a live search. Amazing work. Never hurts to have more backups just in case I guess. Amazing! I'm not in love with trp.red but this is an excellent substitute. Thank you. Have this virtual beer, mate. Don't drink it and drive though! Thank you! This is amazing. You're doing god's work my guy, keep it up! This is amazing. It would be great to have this done on my subreddit, which is obviously at high risk of being banned. Since you already developed the code, would it be particularly difficult to set this up for another sub? Please let me know. Dude, excellent job. The website interface is really smooth, it loads very quickly. I want to give two suggestions though. First: Maybe you shouldn't put asktrp posts in there? Most of the posts in asktrp are not worth anyone's time. It is a good thing to provide advice to someone asking for help. But I don't think it is necessary to add asktrp questions to the archive site. Add more TRP posts if you can. Because the posts and the comments sections on TRP are invaluable. If you already have added the top posts from all time, add the ones from this current year. Add the hot posts. The new posts. Second: For the posts that you have uploaded only a part of the comments section is avaIlable. If possible, try to add the entire comments section for all posts. Because their is a lot of gold in the comments. That being said, you have done an excellent job. It will help a lot of people out there. So congratulations and thank you. You are the hero we all wanted ! Brilliant. Apart from the practical benefit this is a great example of DOING rather than WHINGING in response to the quarantine. Some readers here really are internalising TRP and it's fantastic to see. Well done OP. Can you make it downloadable so we can mirror it?